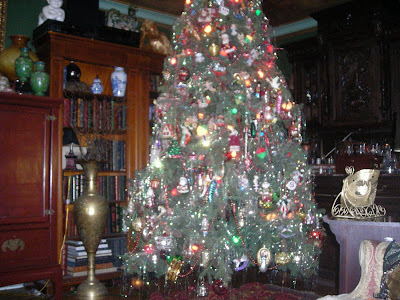 It's the weekend after Thanksgiving -- time to deck the halls for the holidays and Husband Jim has been working on the tree today -- that's his labor of love for Christmas -- the tree! It's big and it does take time but the results, we think, are stunning! We played yesterday and so today the tree is in place and he's been working on it -- we do it one box at a time -- first the lights, then the roping and tree skirt, then the ornaments and finally the tinsel. I've spent the day working on my Met Monday post, being the "go fer", and baking the first batch of Christmas cookies. And yesterday, I switched out all of my CD's for some Christmas ones. Christmas is definitely in the air at Linderhof! But it's Sunday which means that it's time for Sunday Favorites with Chari at Happy to Design. 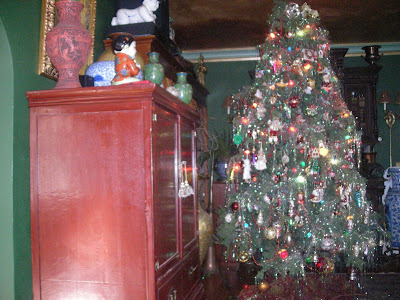 I'm sharing my earliest Christmas post -- about the tree from December 7, 2008 -- the 2010 tree will be similar -- with colored lights and tinsel -- the ornaments are not necessarily in the same place although they are the same ornaments. The Christmas Tree is the centerpiece of our Christmas decorating. A tall tree, 9 feet tall even though our ceilings are only 8 foot 3 (because the last foot of any artificial tree is a branch that sticks straight up to put the star on). Because it does touch the ceiling we've never put a star on top of our tree. After the lights and beading go on, three big bins of ornaments are brought up. 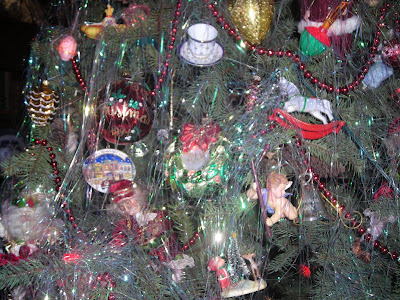 An almost 40 year collection of ornaments go on the tree. And after the ornaments, the final touch is the tinsel. 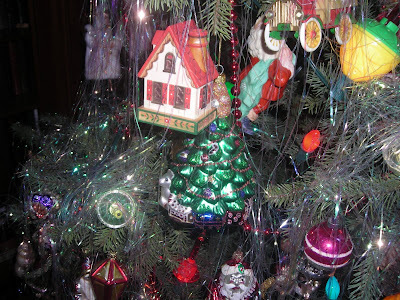 A see through tinsel rather than the silver kind gives the tree what we consider a nice shimmer. The lights are not the tiny white ones but rather the big old fashioned colored ones and bubble lights as well. It is a huge tree and does take up a good bit of living room real estate but we wouldn't have it any other way. This year we put our tree up the weekend before Thanksgiving and I think it will be a new tradition. Especially this year since December came hot on the heels of Thanksgiving weekend. In December, at night with the fire roaring in the fireplace and the Christmas tree alit and carols in the air, it's great to sit with husband Jim on the living room sofa while we sip cocoa and reflect on the season. It's beautiful, Martha. No wonder you enjoy it so much! Sitting with a loved one basking in the glow of the Christmas tree and sipping something hot is one of the best parts of the season! A lot of love went into that tree and it shows! Thanks for sharing it with us again!! Ohhh...your Christmas tree is gorgeous, my friend! You certainly do have a fine collection of beautiful ornaments...they just cover every single inch of that pretty, tall tree! 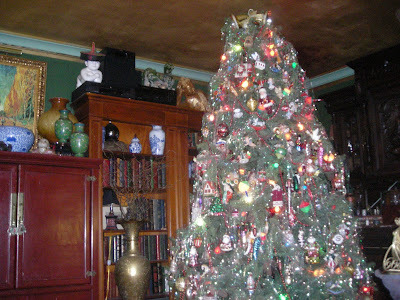 Thank you so much for sharing your beautifully decorated tree with us for Sunday Favorites...what a treat! I can't wait to see your 2010 tree! This is my first time reading this article and I'm glad I did; it's really inspiring, and speaks to a lot of what putting up a tree is all about. Thank you, Martha! "O Christmas Tree, O Christmas tree. . .